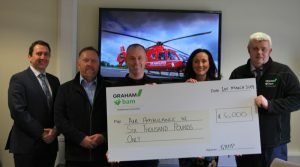 GRAHAM-Bam Healthcare Partnership (GBHP) announced today that it has raised £6,000 for Air Ambulance Northern Ireland (AANI). This will fund a full day of service for AANI. Peter Reavey, GBHP Director, Garry Farmer, GBHP Project Director, Ulster Hospital Project, Bert McCullough, GBHP Contracts Director, Royal & City Hospital Projects and Attracta Mathews, GBHP Regional Community Engagement Advisor visited AANI on Friday 1 March to present the donation to the charity. Peter Reavey GBHP Director said “We actively encourage our employees to positively contribute to communities through volunteering and charitable giving. AANI is making an amazing difference to people right across Northern Ireland, which is why GRAHAM-Bam Healthcare Partnership is delighted to make this donation. GRAHAM-BAM Healthcare Partnership, a joint venture between Co. Down based GRAHAM and BAM Contractors Ltd, delivers strategic healthcare projects on the island of Ireland. Kerry Anderson, AANI’s Head of Fundraising, said: “Serious or life-threatening situations can and do happen regularly and, on average, every single day in Northern Ireland one individual finds themselves in desperate need of the AANI service. We are dedicated to delivering the very best possible patient care, so our service is often the difference between life and death.